From The Victoria Sampler, this gorgeous design has two bright and colorful scenes that can be stitched together or separately! 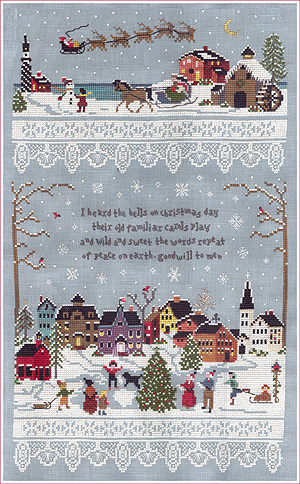 These wintry village scenes are stitched on 28 count Smoky Pearl linen using a variety of silk threads (Accessory Pack #1). The second Accessory Pack contains enough black and white silk for all the rooftops and snow in this winter wonderland.